Back exactly five years ago on 3rd May 2010 I wrote a Blog post about why I was voting for the Lib Dems. Unlike some bloggers I keep my old blog posts online even if I change my mind. In any event this was exactly what I did think in 2010. What I and millions like me did not expect was the coalition that followed. Tuition fees trebled rather than scrapped, free schools opening and massive cuts to public services and benefits. By January 2012 I wrote to Nick Clegg and resigned from the party. Before voting Lib Dem I had been a Labour voter all my life although apparently as a younger child I was something of a Conservative! So when I left the Lib Dems I did first look towards Labour for a political home. But Labour didn't really feel like home although the vast majority of Labour activists and supporters that I know certainly do think very like I do. Ultimately though it was the Labour Party's pro-austerity position that I could not support. Following the decline of local Lib Dems in Suffolk after the coalition (something that I very much regret and has I feel damaged politics in the County) the Green Party was emerging as the main opposition in more rural parts of the county. I looked at its policies and immediately warmed to its anti-austerity "common good" stance. I joined the party and am proud to be standing as a District Council candidate for Stradbroke and Laxfield. The Greens stand alongside the SNP and Plaid Cymru as the main progressive anti-austerity parties. Sadly Labour appears to be continuing its mis-guided support for austerity. There is a brilliant (but long) Guardian article called The austerity delusion by Paul Krugman that explains far better than I could why austerity was a terrible idea in 2010 and an even worse idea today. Indeed outside of the UK most of the rest of the world has realised this and moved on. All this said I am of course hoping that Ed Miliband is the next Prime Minister. If he is it looks certain to be a minority government and that he will need the support of anti-austerity parties to form that government. Such a "coalition of chaos" as the Tory press dub it does in my view represent the best hope for the country. Sadly our two great parties of Government, the Conservatives and Labour have both lost their way. The Conservatives are increasingly becoming a nasty English nationalist party with no place for the much more mainstream "one nation" conservatives that once were the majority of that party. Labour seems unwilling to represent the left of centre progressive voice of most of its party members and voters. Hence its support for austerity and its virtual wipeout in its former heartland in Scotland. No wonder many remain as disillusioned with politics as they did back in 2010. But there are some signs that things are better. The stranglehold of the Murdoch press on the electorate appears to be significantly challenged by online forces such as the brilliant #Milifandom campaign started by a teenage girl too young to vote but angry with the negative way Ed Miliband has been presented by the Tory press. 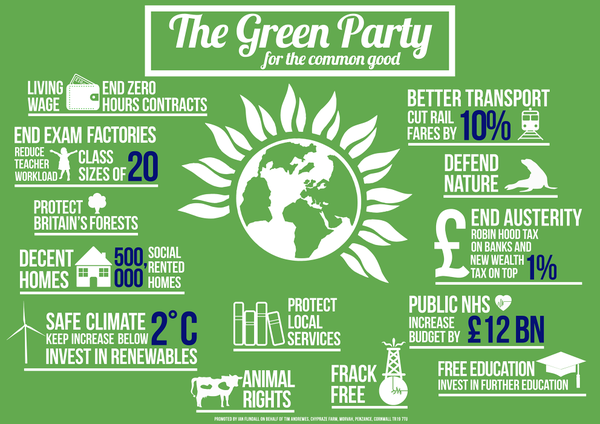 The Green cry to "vote for what you believe in" does resonate strongly although if I lived in Waveney or Ipswich the temptation to vote tactically for Labour or maybe to try using a site such as Voteswap to swap my vote with a Labour supporter elsewhere would be strong. The true end of two party politics that we see at this election means that we are even more in need of a decent electoral system than we were in 2010. The AV referendum was lost with a bit of help from the Tory's friends in the press but actually I think what is needed is significantly more than the tinkering at the edges that AV would have brought. Nothing less than significant constitutional reform will in my view save the UK. We need a true federal system respecting the nations and regions that make up the UK. We need a properly proportional voting system to ensure that all of our votes count. If this election ends up creating a mess or as the Tory spin doctors put it chaos then perhaps that will be the wake up call we all need to create a new political system with a modern constitution fit for the 21st Century.